Methodology and note-taking have been popular topics at The Junto, opinions and preferences ranging from Rachel Herrmann’s defense of good-olde-fashioned index cards, to Michael Hattem’s detailed tour of his digital workflow. I’d like to throw my hat into the ring and suggest yet another tool: timeline software. I’m a visual person, and while a table is technically a “visual,” nothing makes me happier than seeing those rows and columns transform into something a bit more appealing. Minor admission: I’m years late to the timeline game. 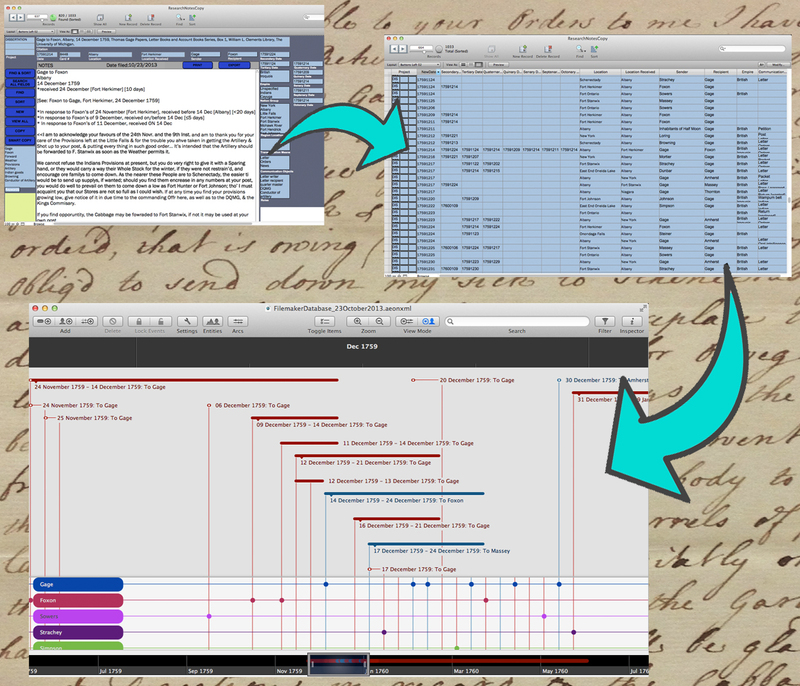 But since I began using chronology software this summer—having finally leaped into the archives with little more than a macbook and a dream—my master timeline has become my best friend, my go-to reference guide. Why? Because timelines gives me easy access to, and visualization of, each and every who, what, where, and when of my project. And then some. It’s my very own personalized tool to quickly know (or estimate) where any individual or object in my project is at a given time. So what? You can do that too with your Endnote, Filemaker, Scribe, etc.? Stay with me. Say I’m in the archive and find a letter from Thomas Gage to Eyre Massey dated April 2, 1759. I have the initial date, Gage’s location in Albany, but can’t find any indication of Massey’s location. 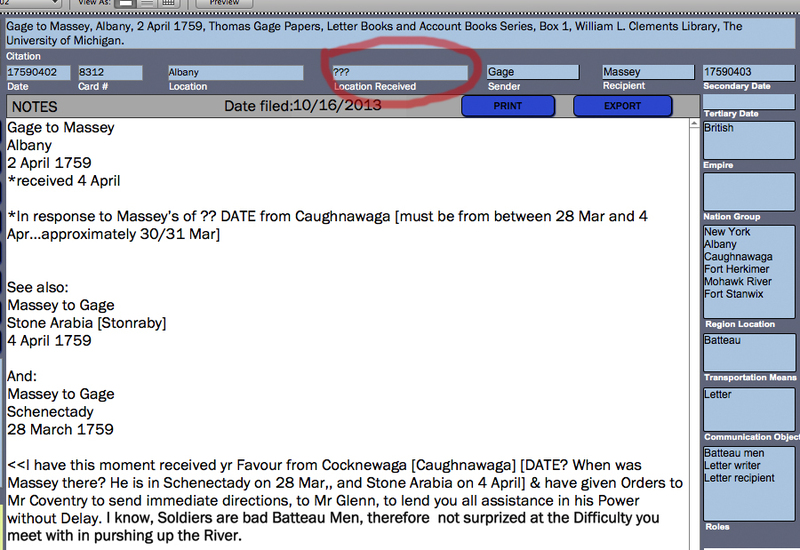 Often times the recipient location is easy, but I know that Massey was on the move in April 1759. 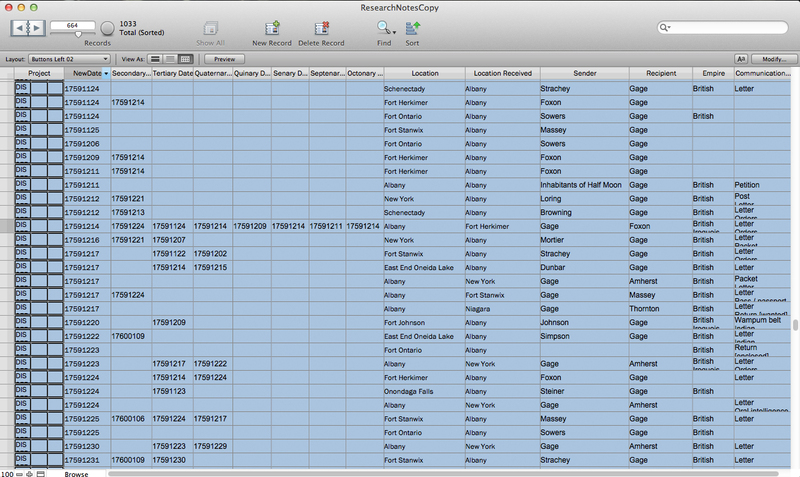 I could guess, or search in my Filemaker notes for any item tagged with Massey from the surrounding few weeks. I could even open all of those entries as a table within Filemaker, arrange it chronologically, and then toggle between table and entry mode. OR, I could just open my Aeon timeline window. And suddenly, I know that Massey was in Stone Arabia on the surrounding days. And since it’s clear that he was only there for a short time, I also know which specific letters to look at next in case Massey mentioned the receipt of any letter from Gage within them. (This time I’m especially lucky—Massey’s letter of April 4, 1759 at Stone Arabia mentions the receipt of Gage’s letter on April 3.) Total time this took? 2 minutes. What makes the timeline especially useful as a reference guide is that I’m unafraid to mix my own data with dates and locations brought in from secondary sources. Since the program doesn’t rely on any external data file that’s shared between programs—rather, I import the information I want to use—I can add timelines and chronologies from published works without having to worry about getting them mixed up with my research. (And because I denote the source in the “Notes,” and use different colors to differentiate primary and secondary source events, they can co-mingle with happy abandon while also giving me an immediate visual cue as to their provenance.) Which also means that it’s easy to casually throw in important contextual dates from beyond the focus of my project—of events elsewhere in North America or around the world. Seeing my own dates as they overlap with key battles, infrastructural developments, and political events taking place far beyond the American interior helps me better make connections between local events and those across empires and the Atlantic world. And so my timeline becomes—more importantly—a useful analytical tool. More acutely, I get a clear picture of how long a particular letter takes to travel, how many letters are coming into a particular fort in a given month, and so on. These observations are not going to carry the weight of more rigorous network analysis or GIS mapping, but a timeline is also a much better tool for me now, while I’m in the midst of research with a LOT of incomplete and unrefined information. 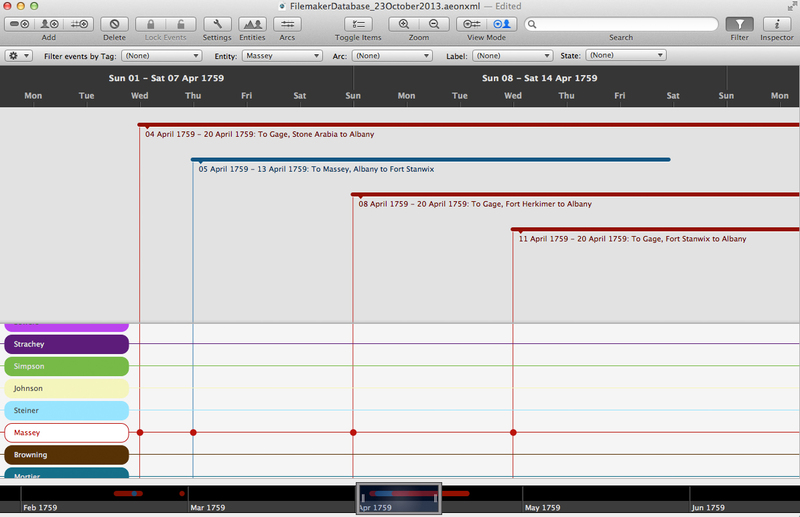 In fact, it’s precisely its utility during the research stage that has won me over to working with timeline software. Not only is it great to filter events by person, but I can also filter them by place. My work in GIS relies on coordinates and vector data, and often (particularly as I hurry through the archives) I don’t have those ready yet. In part, this is due to time, but even more often I simply don’t have coordinates because l don’t immediately know where an eighteenth-century location lies on today’s map. The timeline doesn’t judge me for my lack of precision. Instead, it’s happy to let me label something “Onondaga Falls” or “Besco Creek,” just for now, and then give me back a rough picture of communication flows in and out of those imprecise locations. And there’s the added benefit of imprecision: using contemporary labels for locations also helps me see how place names overlapped and changed—from Oswego, to Camp at Oswego, to Camp at Fort Ontario, to Fort Ontario—over time, and their varying uses by different people. So how did I get to my timeline? How do I build it? What’s the process? Steps 1-7: Read letter. Type notes. Enter into Filemaker. Switch to table view. Export table to Excel. Save Excel as csv. Import into Aeon Timeline. Every few days, rinse and repeat. From there, it’s simple to export the table as an excel spreadsheet, and then save as a csv file. Then you can import the csv into Aeon Timeline. (Of course you can also manually enter events). A quick note on software: There are plenty of timeline programs out there—both free and premium—but I’ve found Aeon to be the best for me. Other popular premium programs that allow for easy spreadsheet import include Smartdraw (Windows only) and TimelineStudio. Like Aeon, these offer free trials so you can see which best fits your needs. There are also plenty of web-based platforms that offer free accounts: Tiki-Toki, Timeglider, Dipity, and Timeline JS, among others. These free options aren’t what I was looking for, both in terms of ease of data input and of quantity of events, but they’re all visually clean, easy-to-use, and great for those just looking to make small timelines of a couple hundred events or less. I’d be curious to know if and how others have used timelines, as well as their experiences moving data between their research tools. Do you use timelines as reference guides as you research? As visuals in presentations? As argumentative devices? Lastly, if you’ve found your go-to software, I’d love to know what you’ve landed on. Has anyone tried to use these timeline software for teaching in the classroom? That looks awesome, Nate. I’ve never done any timeline work with students, but this seems like a really nice option. And just more generally, it’s great to see how you can really use some of these web-based platforms. (I’ll admit that I was skeptical). I’ll definitely give TimelineJS another look down the line. The option of importing from a google spreadsheet–which, by extension, should mean easy enough import of an excel spreadsheet…granted it’s reformatted to fit their guidelines–seems to set TimelineJS apart from many other web alternatives that either can’t or require a premium account to import csv data. I’ve been playing around with aspects of this setup since I saw the post. I think this workflow would be great, but I’m only in the early phases of trying to organize a similar system. Aeon looks great, and Filemaker looks like it would be a nice tool to employ when managing letters and other personal writing. Do you also keep a digital copy of your source – either a scan, photo, or PDF – in your database? Does Aeon ever have trouble importing your information? Hello — It could be neat-o to build an open source timeline. Everyone contributes the dates they’ve collected, and can download the cumulative timeline. If the timelines are well formed (sources, to provide a way to confirm dates) it could help uncover discrepancies and puzzles. Any thoughts? Does this already exist?